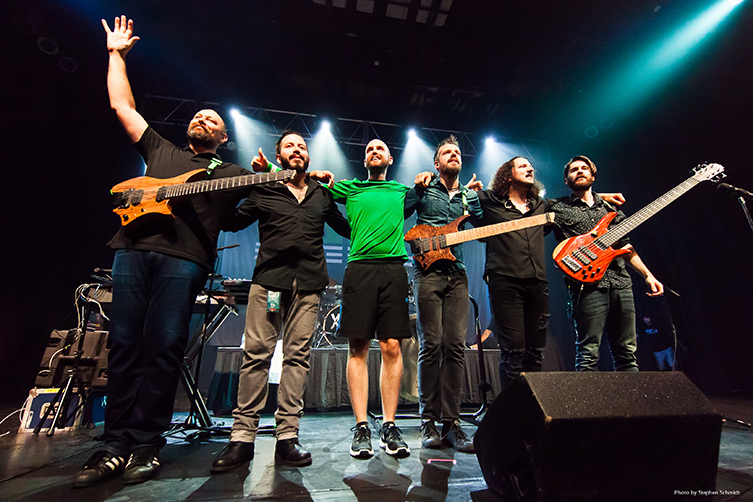 For the last decade, London's Haken have been providing music fans and audiences across the world fresh and exciting Prog Rock. Theirs is a style that blends sci-fi influenced synths and keys with the type of Metal beloved by today's Prog audiences: melodic, exciting, down-tuned and decidedly polyrhythmic! Guys! Thank you for talking with us! You have a new record out and you are about to embark on a tour but let’s begin at the beginning. I understand that Haken began as a project by childhood friends but now includes members from the UK, USA and Mexico. Is that all correct? And are you all located in the same place these days? Yep, Matthew Marshall (ex guitarist), Ross Jennings and I went to primary a long time ago! When we were in our teens we used to meet regularly for casual bedroom jams, which is when we came up with the idea to form Haken. Back then it was a laid back affair and more of a hobby than anything else. As time progressed, we began to take our chosen instruments more seriously and decided that’d be wise to complete our studies before pursuing the band any further. So three years later, we returned from our universities and have gradually built the band into what it is today. 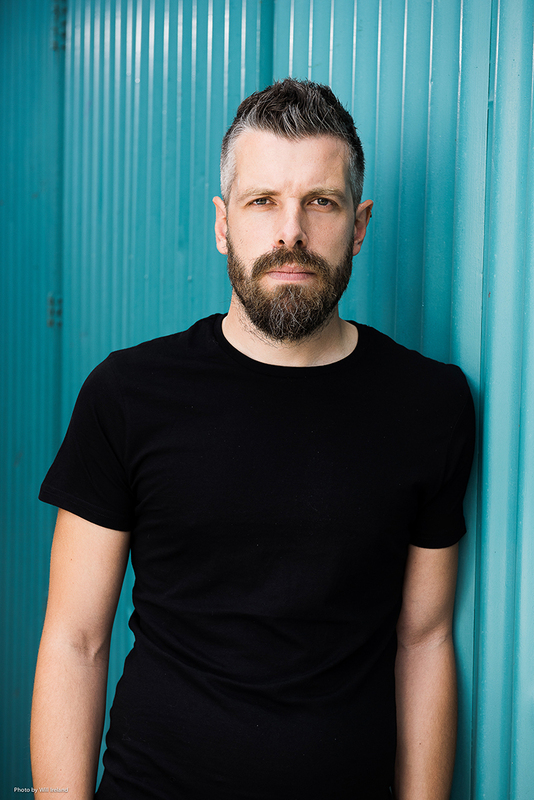 It started out with all us all being based in the UK, but due to some line up changes over the years, we now have Conner who lives in the US and Diego who is situated in Mexico. How does this affect the workings of the band? The transatlantic nature of the band has ended up working in our favour. Sharing ideas and communicating with each other on the Internet has never been easier. For the last two albums, we’ve had an online file sharing space, in which we bounce ideas back and forth. Someone will pick an idea to work on, and then present it back to the rest of the guys. In some cases it means that we can be working on four or five ideas simultaneously, which has proved to be a really efficient way of working for us. We’ve often found can be more productive when working individually as sometimes having an undiluted, singular vision for certain ideas can be most effective. Also in terms of touring, it has worked out well too. We often use Conner’s pad as a base before a US tour and one of our houses in UK as a starting point for our European runs. For the uninitiated, where did the name ‘Haken’ come from and how do you pronounce it? pronounced Hay-ken and not Har-ken. Over the years a lot of people would mispronounce our name, so we made a t-shirt with a picture Kevin Bacon’s face on it to help people out. I think it was lost on most people so it was unfortunately a pretty short-lived t-shirt! 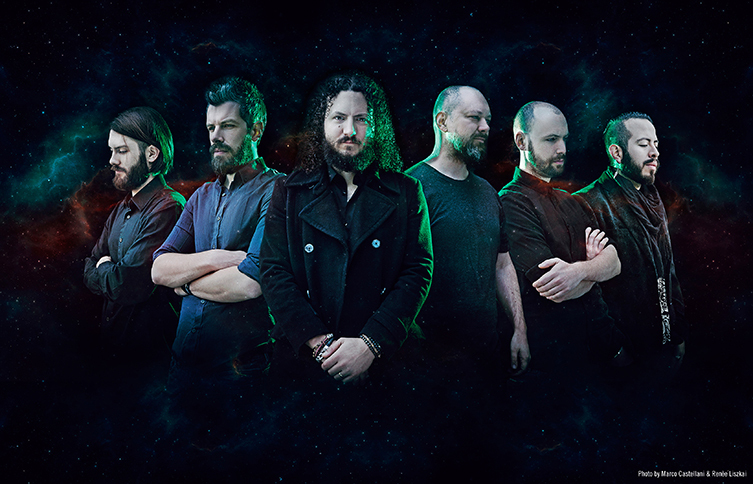 Haken have always made huge, complicated, expansive music: what was the initial spark that brought you all together? definitely a huge influence in forming Haken. Richard, you appear to have been the main songwriter at the beginning. Is this still the case today? For our first 3 albums I generally I took care of the main writing duties when it came to the music. I used build the blueprints for each track in MIDI format and send it to the rest of the guys. We’d then take these arrangements to a rehearsal space and twist and shuffle things around to we arrived at something we were all happy with. Ray was studying Tuba at the Guildhall around this time, so we always a free space to jam, which allowed us to cram in a whole bunch of rehearsing before we came round to recording the albums! We decided to try something new when it came to composing Affinity by approaching it in a fully collaborative way from the outset. Working in this fully inclusive way really helped push our sound in a new exciting direction, so we naturally decided to continue working in this way for Vector. The last two records feel like the most honest reflection of our collective influences within the band; it definitely feels like there’s a part of each of us on these last two records. Some of your previous albums, like Aquarius, for example, have narratives within them, like concept albums. Is this the case with Vector, your most recently released album? interpret in his or her own way, so I don’t want to go into to too much depth and ruin things for them. Richard, you play both keyboards and guitar. When writing, do you prefer one instrument over the other? My Mum’s a piano teacher so I was lucky enough to started out on piano from a fairly young age. I have fond memories of waking up to countless student blasting out the likes of Bach and Chopin downstairs on our piano. I think having this constant exposure to music really got the musical clogs turning in my head and essentially inspired me to compose my own stuff later on in life. I genuinely like to write on both instruments depending on my mood or what a particular song requires. Each instrument generally harvests different results. I’ve found that the guitar lends itself to more riff and rhythmic based ideas, whereas the keyboard always ends up being more about the texture and harmony for me. I think my ultimate goal is to try and create a symbiotic relationship between both instruments when writing. What is your writing process? Is it as simple as ‘riffs on guitar, epic bits on keys’? It’s hard to pinpoint what my actual writing process is as it often changes from song to song. A lot of the time it just starts out with a simple idea, which is then expanded upon over time. The hardest part is finding that ‘special’ idea that is strong enough to carry the whole song. Once I’ve found the idea, it just a case of bleeding it for all it’s worth and using it as a thread to tie the rest of the song together with. A lot of the time there will be numerous variations of a theme within each of our tracks, which gives the piece a sense of continuity. Recently, I’ve been doing a lot of experimenting with rhythm, and a lot of the stuff I’ve been writing the is often based a short rhythmic motif. A couple of examples of this approach to writing are ‘Initiate’ and ‘Puzzle box. However, there are of course some ‘riffs on guitar, epic bits on keys’ moments in our music though. Why change an age-old formula; if it works, it works. What were both of your influences growing up? Haken has a very cinematic sound, did certain movies play a big influence too? I have always admired the writing style of film composers. They seem to have a natural ability to develop themes over lengthy songs, and clearly have an idea of the bigger picture as they are composing. I would consider composers like Alexandre Desplat, Danny Elfman and John Williams as a few of my favourites. A band that had a big impact on me in my youth was Radiohead. Ross and I used to cover a lot of their songs in a high school band, so I’d definitely definitely say their atypical writing style has influenced me. My Dad was heavily into Pink Floyd, so their music undoubtedly seeped its way into my subconscious over the years. More recently, I’ve been listening to the likes of Tigran Hamasyan, Agent Fresco and Bon Iver, all of which are blowing my mind on a daily basis. Listening to your music, I can hear pieces of Periphery, Mr Bungle, 80’s-era Marillion and even the music of the Cirque Du Soleil in there: Would that be on point? I’m definitely a fan of Mr bungle and Periphery so those two are definitely on point. To be honest, I’ve never really gotten into Marillion, which is probably considered a cardinal sin by most prog fans. Cirque Du Soleil’s an interesting choice! I’ve seen it once live, but aren’t really familiar enough with the music to cite it as an influence. I’ll definitely have to revisit now that you’ve mentioned it. A couple more key bands to throw in the mix would be Gentle Giant and Meshuggah. I think we even coined the term ‘Djentle Djiant’ at one point! Djentle Djiant! I love that, haha! Lots of Haken’s music is highly technical. Do you find you still need to practice a lot? If so, what constitutes a practice session for both of you? To be honest, I’m never really content with my capabilities on the guitar and piano and always seem to have a perpetual urge to practise! Nowadays, with a son to keep me busy, time isn’t always on my side. I generally try to compress my practise time down to 2 hours or so if possible, and for the most part it consists of preparing music for tours. I will often sit down to practise with a clear idea of what I’m going to do, but then get preoccupied with a new song idea and the whole session goes out the window! I guess writing is a form of practice in itself so it’s not so bad. With the music’s relative complexity in mind, does any of it ever prove a struggle to perform live? Yes! I will often write parts that challenge me in order to help push myself to the next level, then regret it immensely when it comes to playing it live night after night. There are some of the trickiest passages we’ve ever written on Vector, so touring that stuff has certainly kept us on our toes! So, let’s talk gear. I’ve seen pics of you using Strandberg and Music Man guitars. What are you currently employing both live and in the studio? innovative brand amongst a whole host of hugely talented guitarists. My axe of choice is usually a custom Boden 8-string, but I sometimes deviate from this. Ola recently sent me a Salen model, which is a hybrid of the strandberg design with the classic telecaster. It’s an absolute dream to play and basically fuses two of my greatest loves when it comes to guitar. 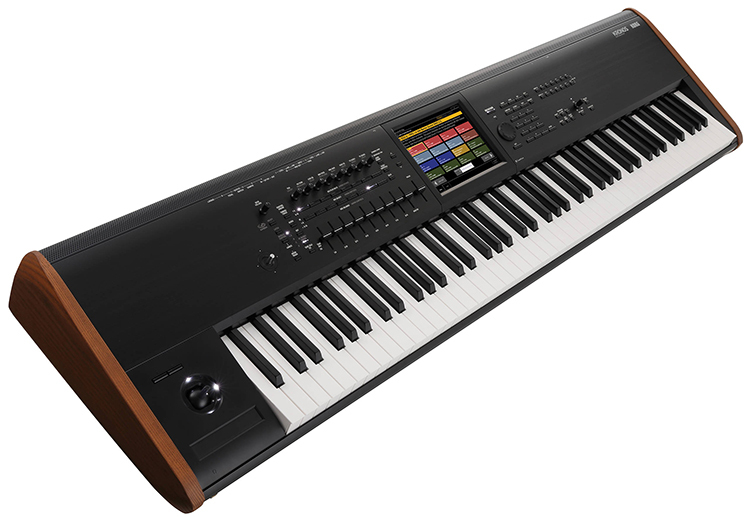 For keyboards, I use a Korg Kronos for when we tour Europe or a controller keyboard hooked up to mainstage for elsewhere. When I’m recording at home I’ve recently been enjoying the Arturia bundle. Those guys really have the finger on the pulse when it comes to nailing those retro tones! They certainly do! Plus, it's cheper than paying 20 grand for an old Yamaha CS80! For the extended range guitars, are you using any unusual tunings? I’m using standard tuning for my 8-string. I often need to go down to a low E for certain sections in some songs, so I use a pitchshifter effect that detunes everything by a wholetone. It saves the hassle of having to switch guitars mid song. We do have one song from our ‘Visions’ album, called ‘Mind’s Eye’ which is in DADGAD. I always use my Telecaster for that one. What plectrum types and string gauges do you prefer? I use Jazz III Dunlop plectrums with a 1.14 gauge. They were recently kind enough to make some custom Vector designs for Charlie and I, which went down a storm on our last tour. I use regular gauge Ernie Ball strings, which have always served me well. I think I’ve only broken 1 string in the ten years or so since we’ve been playing live in Haken, so they must be doing something right! You guys are both fans of re-amping, is that correct? How does that benefit your recordings over more traditional methods? Yeah we’ve been reamping all the heavy parts on our records since Aquarius. This has enabled us to record all our parts at home, which definitely saves us a lot of money. A more traditional method of recording would blow a hole through our budget due to amount of studio time we’d need to pay out for. Also, recording at home, without as many time and financial constraints, allows us to be in a more relaxed state of mind, which is often when the creative juices start flowing. Which that in mind, does that mean you guys ‘go digital’ for touring? Are there any downsides at all to digital rigs? Charlie and I both use Fractal Audio’s AX8 pedal. It’s built like an absolute brick and since buying it 3 years ago I haven’t have single issue. I’ve probably cursed it now! It allows us to have a consistent sound from show to show and due to the almost unlimited amount of amp, cab and effect combinations we can pretty much get any sound we want. All of that with the added bonus that we can fit it into a laptop case makes the ‘going digital’ option a no brainer for me! You are an intimidatingly good guitarist: what tips could you share with our readers on playing outside the usual shapes and parameters we all use on guitar? Thanks a lot! You’re too kind. Well, I’m often intimidated by the sheer amount of ridiculous guitarist on Instagram and Youtube these days. I try to refrain from browsing too much as it just makes me depressed! One practising device that has always helped me is to learn music from other instruments on the guitar. It’s a really fun way to push your creativity into some new areas. An example of this is in the intro of our track ‘Eternal Rain’. I wanted to create a cascading, rain-like affect on the guitar, so I approach it in piano-like by incorporating some 8-finger tapping. Playing in this way definitely helped me explore some new ideas that I wouldn’t have usually come up with with a more traditional approach. 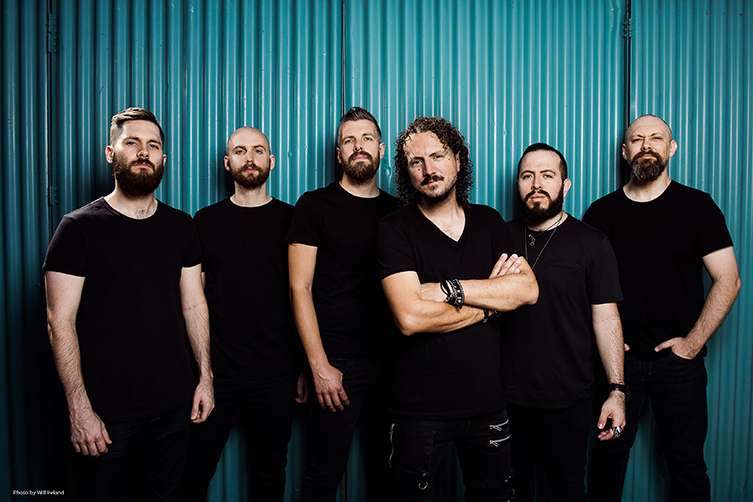 Haken are touring in the UK soon: what can audiences expect from a Haken show? We can’t wait to play back on our home turf again. This time we’ll be bringing a new light package with a fully programmed show, which is something we’ve never done in the Europe before. We road-tested this new show in US last year, and all the new production we’ve added really adds another dimension to the show. In terms of the set we’ll be playing a bunch of tracks from Vector, plus some of our favourites from our back catalogue. Also, the amazing Vola and Bent Knee will be joining us, so it promises to be an amazing night! Finally, what does it take in today’s music business climate to sustain long term careers? The music industry over saturated with a crazy amount of bands, which is making it more and more tricky for people to ‘make it’ as musicians. I think the first thing to do would be to set yourself clear goals and do everything in your power. We’re still working towards a lot of the set out in the early days of Haken, but we’re getting there. I think it’s also important to find a job than provide you flexibility to pursue your musical ambitions on the side, at least until you’re at a point where you can fully commit to it. Most of us within the band still teach in between tours. Rich, it's been great talking to you. Thank you and we'll see you on tour!